Kareem Abdul-Jabbar is one of the greatest players in NBA and college basketball history. He played with a dominance and flair that is unmatched and his name has become synonymous with greatness. Because of this, Kareem Abdul-Jabbar cards, notably his early releases and autographed options, are in high demand in the hobby. Kareem Abdul-Jabbar was born Lew Alcindor and maintained his given name until after he joined the NBA. Before changing to Kareem Abdul-Jabbar, Alcindor had made quite a name for himself as a member of the UCLA Bruins. He helped lead the team coached by John Wooden to three straight NCAA Championships (1967,1968,1969). Alcindor was named the Player of the Year in 1967 and 1969 and was the NCAA Final Four Most Outstanding Player in each of the championship seasons. 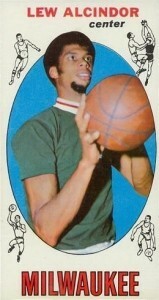 Upon graduation from UCLA, Lew Alcindor left to pursue professional basketball. Although he eventually chose the NBA, the 7'2" Lew Alcindor was the number one overall pick in both the 1969 NBA Draft and ABA Draft. He was also approached by the Harlem Globetrotters with a lucrative deal. The Milwaukee Bucks and NBA emerged as the winners and Alcindor signed with the team. He was named NBA Rookie of the Year and helped double the Bucks' win total from the previous season. In his second season, Alcindor put together an impressive list of accolades that included the MVP award, scoring title, NBA Championship and Finals MVP. Soon after, he formally changed his name to Kareem Abdul-Jabbar, in honor of his Islamic religious beliefs. Kareem Abdul-Jabbar would remain with the Bucks until 1975, when he requested a trade, and joined the Los Angeles Lakers for the 1975-76 season. He became the face of the franchise and his signature skyhook rained down for many years. Although he was not as dominant in the 1980's, Abdul-Jabbar and another number overall pick, Magic Johnson, kept the Lakers in the yearly title hunt. When he finally hung up his sneakers, his career stats read like a video game. Playing for an astonishing 20 seasons, Abdul-Jabbar was a 19-time All-Star, six-time NBA champion, six-time MVP, and two-time Finals MVP. He finished his career with the highest career scoring amount in NBA history, totaling 38,387 points, and still maintains the top spot. Kareem Abdul-Jabbar was inducted into the Basketball Hall of Fame in 1995 and joined the National Collegiate Basketball Hall of Fame in 2006. Following his retirement, Abdul-Jabbar pursued coaching positions and had multiple stints as an assistant and scout. Outside of basketball, Kareem Abdul-Jabbar appeared in various movies and television shows, such as memorable cameo roles in Airplane and Fletch. He has also written several books, including basketball and non-basketball topics. With 20 seasons under his belt, Kareem Abdul-Jabbar has many cards available from his playing days, and most can be acquired for cheap. Obviously, the top options from his NBA career are the earliest cards. His sole rookie card is very popular with basketball collectors and Kareem Abdul-Jabbar autographs are also a hot commodity. Click links to shop for singles on eBay. 1969-70 Topps is not the strongest design, but the tallboy format is good way to showcase the size of Kareem Abdul-Jabbar. The blue background and red text does not make a great combination and the four drawings make an odd addition on the only Abdul-Jabbar rookie card. Since this was before his name change, he is listed as Lew Alcindor. Raw copies with wear can be found for under $30, while high-grades can go for thousands. Part of a fantastic signed set that was ahead of the autograph craze of the next decade, Epic Signatures brought a Hall of Fame lineup, low-key design, and large signing area to the collecting world. Boxes are nearly impossible to find and many of the players, including Kareem Abdul-Jabbar, don't surface often. Although the base signed cards were not numbered, the image shown below is the Century Parallel, which is hand numbered to 100. 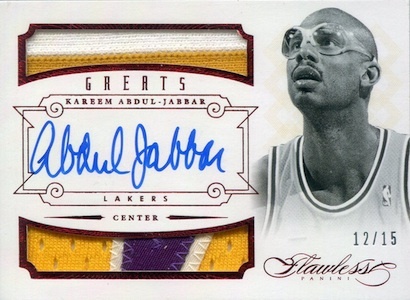 Flawless brought the flash and some of the top current cards for Kareem Abdul-Jabbar can be found in this premium product. The most popular options include the autographed jersey card shown below. It is interesting to note that the "Greats" card utilizes a virtually identical image to the Upper Deck Century Legends card above. 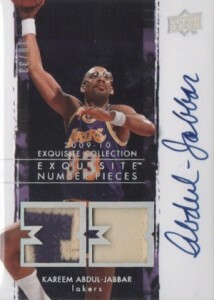 Like Flawless, 2012-13 Immaculate provide high-end options for Kareem Abdul-Jabbar collectors. 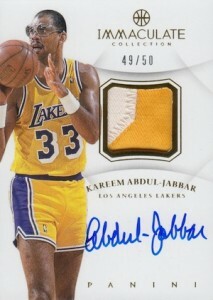 Multiple signed Kareem Abdul-Jabbar cards can be found in this new product. 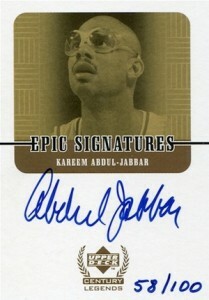 Although he has not signed for Exquisite in several years, the cards that remain are some of the top high-end Kareem Abdul-Jabbar cards available today. Again, cards that include a signature and jersey piece command the highest prices. 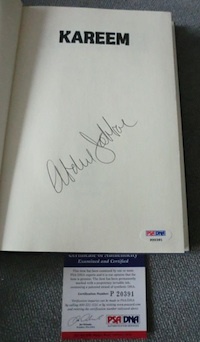 In this section, you will find examples of what an authentic Kareem Abdul-Jabbar autograph looks like. This can be used as a first point of reference for determining the legitimacy of autograph memorabilia, but is not a substitute for having your items authenticated by a well-respected professional autograph authentication company. Reputable authentication companies include JSA, PSA and Mounted Memories to name a few. Kareem Abdul-Jabbar Key Signature Attributes: It is important to note that Kareem Abdul-Jabbar was originally named Lew Alcindor. 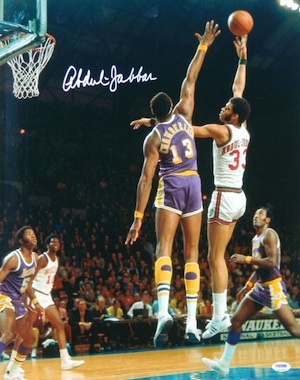 Abdul-Jabbar signed with the Lew Alcindor name until 1971. Although tough to find, Lew Alcindor signatures are still around. 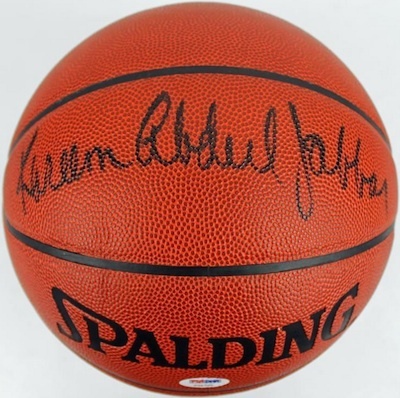 Although his full name is Kareem Abdul-Jabbar, the first name is normally omitted and most of his signatures begin with a large A. The entire signature is written in a legible cursive and every letter is easily distinguishable. 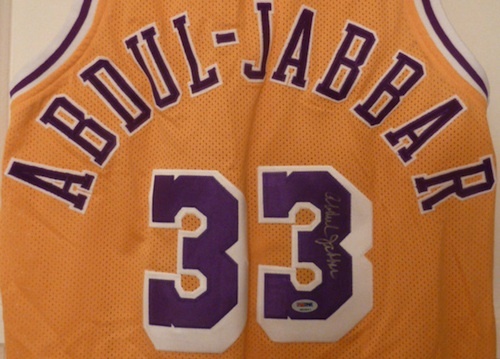 The use of a hyphen between Abdul and Jabbar is inconsistent, but it appears that it is omitted more often than not. The first lowercase a in Jabbar is noticeably larger and more rounded than the second. I have a 1967 signed program by Lew Alcindor(AKA Kareem Abdul-Jabbar), Oregon State vs UCLA Also signature by Mike Warren ( actor In the Heat of the Night) and Kenny Heitz) My father attended the game, and also record teams stats. Curious to what something like that would be valued at?